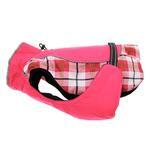 Hit the slopes and enjoy the crisp weather with the Alpine All-Weather Dog Coat in Raspberry Plaid! 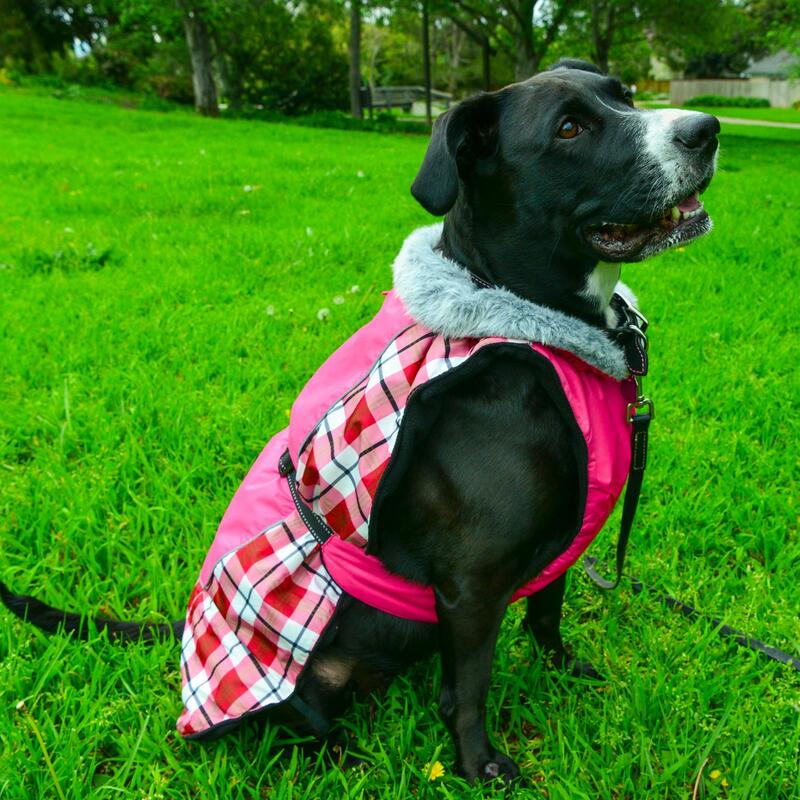 Cold weather won't hold your canine back when they're outfitted in Doggie Design's Alpine All-Weather Dog Coat in Raspberry Plaid! You'll both stay active no matter the weather with this easy-to-use dog parka, but the workout won't come from wrestling your dog into their winter gear. Simply slip the jacket over your dog's head, wrap the chest panel around your dog's torso and by clip it closed on the back. Optional elastic leg straps are provided to secure the jacket over the rear legs to offer more protection from blustery winds. Like high-quality human winter coats, the Alpine All-Weather Dog Coats are made with the latest technologies in outerwear. The outer shell is made of a tough, waterproof nylon. The interior loft features extra polyfill for added warmth and protection without too much bulk. The layer closest to your dog is lined with a thick, warm fleece. The cleverly-designed leash hole features a waterproof flap to prevent moisture or drafts from penetrating the coat. This works with the D-rings on both collars and harnesses. The coat collar is lined with faux fur for extra warmth around your pet's sensitive neck area. The collar can be worn up or down to suit the conditions and your dog's build. 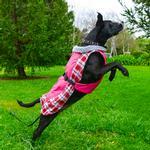 For maximum comfort, Alpine All-Weather Dog Coat also features a neck cinch to limit drafts. With the shorter days of the season, you can rest easy knowing you and your pup will be visible in low-light conditions with reflective safety straps and trim. Check out the other colors and sizes to outfit the whole pack! Alpine All Weather Dog Coat by Doggie Design - Raspberry Plaid Customer Photos - Send us your photo! Awwww My Daisy is so cute and warm in her Alpine Coat! I keep Daisy's schnauzer skirt long as year round. Which makes it hard for her to wear sweaters and coats without the hair getting caught or tangled in velcro or a zipper. Alpine coats are perfect! Coming up to snap closed on the back is great...and so easy to put on! Thank you! My name is Brie. I am a 22 month old Frenchie. This coat is new to me. I now know just how much my dad really loves me. Dad & I just spent an hour outside. I came inside warm & dry. We are going back out later for another romp in the snow. I CAN'T WAIT! LOVE this coat! Lilly loves her new winter coat! love this coat...great for our wisconsin winters! This is Lola just resting on a park bench after doing some laps around the track at her favorite park! She certainly didn’t have to worry about being cold, as she was wearing her Alpine All Weather Dog Coat by Doggie Design in raspberry plaid. The coat is beautifully made and not heavy and bulky, so she had no problem walking for quite some time-4 laps to be exact-while staying warm and toasty. Keep the great clothes coming...my Lola will be more than happy to keep on wearing them.! Mellie is a Goldendoodle that was born on the day my sis, Melanie, passed away. She is my gift from God and also a certified therapy dog. 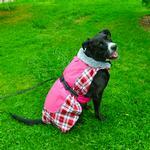 She spreads love and smiles wherever she goes and now will look adorable in her raspberry plaid Alpine coat! It's 10 degrees out! Otis, (5 years old) Angus (17 years old) and Maude (15 years old) are all bundled up in their coats from Baxter Boo! DeDe is ready for the cold weather in her pretty new coat and scarf. Here is Sassy sporting her new "sassy" winter coat. She's not a huge fan of doggie clothing, but she looks so darn cute in them! Rescue abandoned by mother at birth in bitter cold WI outside. She's a survivor and also beat Parvo. Now at 14 mos. in K9 Novice 2 obedience and Agility. She's kind of bummed it snowed again in March but loves her coat. FYI, only 43 lbs but needed 2XL for chest. I wish more people would give the size they got with their pic. It really helps on returns!! Since Charley is a puppy and is growing so fast, this is the second winter coat she's had this year! Keeps her warm, dry and super cute!! Maddie stylin' in her new coat today from BaxterBoo - fits her better than any coat I've ever gotten her, and I think she likes it too!! Thank you BaxterBoo!! Posted On 01/29/19 by Brie from Hamburg, NJ Yes, Brie recommends this product! My name is Brie. I am a 22 month old Frenchie with a 15 inch neck, 21 inch chest with a 14 inch back. I ordered a XL and it fits great. I wish my dad ordered one last year. The lining keeps me real WARM. The outer shell keeps me DRY. The chest protector is a great addition to this coat. It is incredibly easy to get into and out of. I LOVE IT!!! I love it soooo much I ordered another in tan plaid and the dedicated rain coat, without the liner, for warmer months. GREAT product. A must have for short hair dogs both male & female. Posted On 01/16/19 by Susie A from , Yes, Susie A recommends this product! This is our all time favorite dog coat we have bought. It is sooo easy to put on and take off of Daisy. And she is always so warm! Thank you! Posted On 01/12/19 by Liz C from Washington, DC Yes, Liz C recommends this product! Our English Bulldog Clementine loves this coat! It’s made of parka material on the outside and warm fuzzy fleece inside. Best of all it covers their bellies! Clementine is 43 LBs and wears an XL. finally a coat that fits! Posted On 12/02/18 by RobinMae from Milwaukee, WI Yes, RobinMae recommends this product! absolutely love this coat...the color, the workmanship and most of all the fit! for the first time my girl has a coat that fits both her length and chest perfectly! for other shoppers reference, essee is wearing the xl...from neck to docked tail she is 18 inches...she has a 24 inch girth and her neck is about 18 inches...she weighs 35 lbs. Posted On 10/25/18 by Reesa G from Little Rock, AR Yes, Reesa G recommends this product! Purchased for my 50 pound English Bulldog and while it's a tad too long, it fits nicely everywhere else. I probably could go down from a 2X to an XLG, but I'm worried the belly strap wouldn't fit. Nice, bright colors and it seems like it will be very warm. Posted On 01/09/18 by James A from Annandale, VA Yes, James A recommends this product! I really liked this dog coat because I could tell it was well-insulated and it was easy to put on and take off of my dog. I liked the fact it doesn't have any Velcro straps to keep it on, because in my experience Velcro straps wear down quickly and then you're continually hassled by the coat not staying on your dog. Posted On 12/09/17 by Amanda M from , NY Yes, Amanda M recommends this product! I bought this coat in a size 5X for my European great Dane. She is 2 years old and about 135 pounds. The coat fits her perfectly and looks great on her. She wears it outside all the time and it keeps her nice and toasty, I think she gets insulted when I take it off her! She loves playing in the snow and now we don't have to worry about her getting cold! Posted On 11/26/17 by Rebecca H from Chicopee, MA Yes, Rebecca H recommends this product! Bought this for our female Doberman following size chart but Jacket was way too big, with some sewing I have it fitting better.. Overall nice construction and quality material. Posted On 11/23/17 by Darlynn N from Bowie, MD Yes, Darlynn N recommends this product! Posted On 07/19/17 by Rachelle R from Lake in the hills, IL Yes, Rachelle R recommends this product! Posted On 07/15/17 by Denise N from , NY Yes, Denise N recommends this product! This is a wonderful coat & is made very well. I like that it has the chest area covered. I think that feature is a bonus for the little ones. Bought on sale & feel it was a great buy. Def an even better buy for the larger breeds as the bigger sizes tend to be expensive and at time of my purchase all sizes were $12.50!!. I do believe it runs on the small side..when in doubt perhaps size up. Lovely shade of carnation pink. Posted On 06/30/17 by paula ashby from chinchilla, Yes, paula ashby recommends this product! Posted On 06/29/17 by paula ashby from chinchilla, Yes, paula ashby recommends this product! High quality coat and perfect fit! Posted On 02/27/17 by Karen R from West Peterborough, NH Yes, Karen R recommends this product! I got this for my Doberman who is VERY hard to fit a coat for. Well, this coat fits her like a glove! I love the straps for the back legs and the snap-like clip to wrap around her chest and belly provided a phenomenal and perfect fit. There is even a pull cord to make the neck fit a little more snug. Needless to say, after dashing around in the woods or in the yard, this coat stays put. Great design and very high quality. I am more than pleased with this - so much so, that I ended up buying her TWO more of these coats in different colors just to be sure that once one wears out (if that is even possible), that we'll have plenty of backup coats for years to come. Posted On 02/07/17 by ROBERT W from LOCKPORT, NY Yes, ROBERT W recommends this product! Posted On 11/26/16 by Char S from Boise, ID Yes, Char S recommends this product! Very fast shipping. Coat was too big so returned and ordered another and was also received quickly. Very well made.